A delicious fruit and cheese platter for breakfast? Why not? Let it be known that if my digestive tract could take it, I would probably eat 2-3lbs of cheese a week. Seriously. If I were to become stranded on a desert island, my first request upon entering civilization would be a fruit and cheese platter. 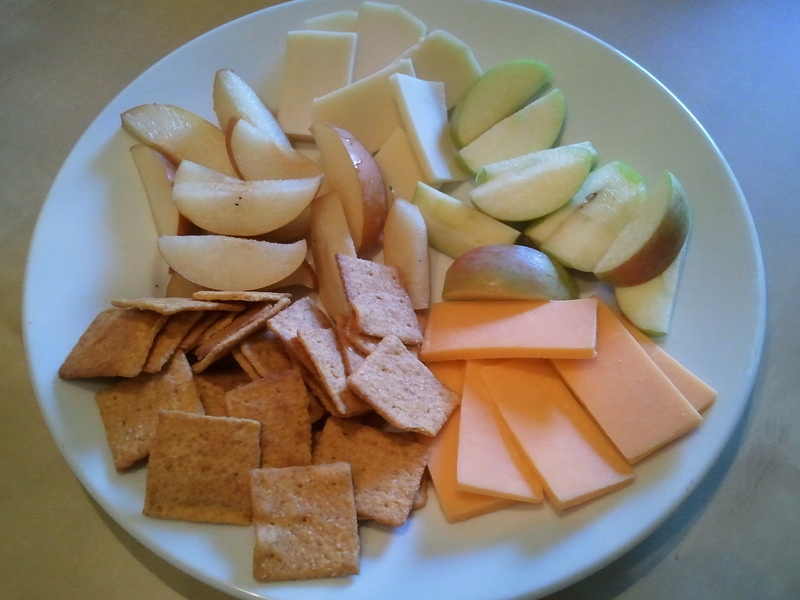 I’m not quite sure when I fell madly in love with the fruit, cheese and cracker platter, but I do recall climbing into bed at night with a good book and a platter of apples, pears, cheese and crackers quite often while living in Portland. Perhaps it was the chilly nights in the Fall when darkness fell early and I could justify dinner and bed at the same time. At 7 o’clock. What I do know, is that I have a particularly strong craving for apples and cheese in the Fall and this year is no different except that I’ve added Asian Pears to the plate along with some of the Artisan cheeses available at the Farmers Market. I tasted my first Asian Pear four years ago at the Truckee Farmer’s Market. When I asked one of farmers about the hard, round pear, he offered me a slice. “Here, taste. That’s the best way to figure it out.” I was fascinated with the taste and texture – half apple and half pear. Asian pears have the crispness of an apple combined with the mildness of a pear and one of the things I like best about them is that they don’t get all mushy or brown as they ripen – they stay really crisp. I think Asian pears are best eaten straight from the fruit basket and I have a hard time keeping them in the house during their limited season – usually October to early November. In fact, the first weekend I brought them home this year, Joel and Madison ate them all before I had even tried one. When I finally did get my hands on one, I sliced it up along with a granny smith apple and ate it with some wheat thins and several different types of cheeses – sharp cheddar, Swiss and Monterrey jack. Like I mentioned before, at certain times of the year, I’m known to eat a fruit and cheese platter once a day for a month. Sometimes I add Gala apples, but most of all I like experimenting with different cheeses. Tillamook sharp cheddar and this funky “white-cheddar-Swiss” that I get from the Farmers Market are my favorite, but really I’ll take a good Monterrey Jack, mild cheddar or crumbly cheese, (Gorgonzola, blue cheese) any day. Maybe it’s not the most low fat meal on the planet, but it sure tastes good.